Believed in the middle ages to be Aristotle's letter to Alexander the Great, 'About the Secrets of Secrets' concerns government and is a Latin translation of an Arabic work. A London scribe and King's Clerk, Walter of Milemete, and a team of artists probably made this richly decorated copy in 1326-1327. Milemete intended it to accompany his own treatise on royal virtues for presentation to Edward III. The 'Secrets' was owned by the Earls of Leicester, at Holkham Hall in Norfolk, from the 17th to the 20th centuries. All the pages of the book were intended to have at least broad decorated borders. 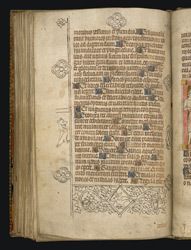 This page of text, from a section on the humours of the body, remains unfinished, as do a number of others, raising doubt that Milemete ever presented the book to the king. Nevertheless, it provides an opportunity to see the working methods of illuminators. It has been laid out, decoration sketched, text written, gilding applied, and ink applied over the sketch. Work stopped during the application of colour. Colour has been applied to the letters beginning sentences, but the artist who painted the decoration never began his work on this page. Division of labour was usual in late medieval book production.